When I left the corporate world to home school and raise my three children our income dropped by a whopping 60% and I had to return the perks like my corporate car, credit card, lap top and cell phone. Though I was terrified, I knew that my frugal money management style would be very helpful at this critical time. Three years later, I am grateful that my husband encouraged me to follow my heart and we are happier than ever with our life together as a family living on only one income. What initially stood out to me while reading this book is that the author keeps in mind that many women (and men) are extremely busy and may not necessarily have the time to cut out tons of coupons or go from store to store to stock up. Rather, she offers practical and simple advice that I can personally say has really worked in our life. It is written in a way that is easy to follow and is not going to be overwhelming to those new to a money savings lifestyle. I decided to take myself out of my own comfort zone and take the author’s advice in the chapter titled, “Planning Never Tasted So Good”. I will freely admit that I have never been an advocate of meal planning because I am more likely to decide what we are eating the day of. After reading this section of the book, I incorporated her suggestions and actually planned one week’s worth of meals based on what I had in the freezer and it turned out surprisingly well. I was able to stretch a more expensive piece of organic chuck roast into two delicious meals, the main roast and vegetables and then tasty hot (leftover) beef & cheese sandwiches that were a big hit with our family the next night. Later in the week we enjoyed a delicious herb roasted chicken and then I made a wonderful homemade chicken noodle soup from scratch making a stock and using left over chicken and vegetables. I didn’t have the stress of wondering “what will we eat tonight” and I was able to stretch our food budget for the week even further than usual. Maybe there is something to meal planning after all……….. Overall, I really enjoyed this book and would highly recommend it for anyone who is looking to save money, eliminate waste and stretch your budget with easy to follow, helpful advice. You are invited to visit the author’s website to learn more or to purchase your copy of this book. 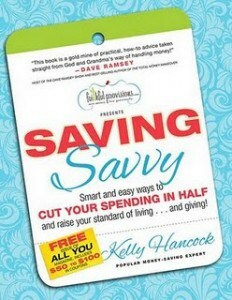 *Fun bonus: With your copy of Saving Savvy you can receive a FREE issue of ALL YOU magazine. It is one of my favorite magazines for money savings tips and it even has lots of coupons in every issue.